Granular materials appear in a broad range of industrial processes, including mineral processing, plastics manufacturing, ceramic component, pharmaceutical tablets and food products. Engineers and scientists are always seeking efficient tools that can characterize, predict, or simulate the effective material properties in a timely manner and with acceptable accuracy, such that the cost for design and develop novel composite granular materials could be reduced. The major scope of this dissertation covers the development, verification and validation of particle system simulations, including solid-liquid two-phase particle mixing process and foaming asphalt process. High shear mixing process is investigated in detail with different types of mixers. Besides particle mixing study, one liquid-gas two phase foaming asphalt simulation is studied to show the broad capacity of our particulate dynamics simulation scheme. Methodologies and numerical studies for different scenarios are presented, and acceleration plans to speed up the simulations are discussed in detail. The dissertation starts with the problem statement, which briefly demonstrates the background of the problem and introduces the numerical models built from the physical world. In this work, liquid-solid two-phase particle mixing process is mainly studied. These mixing processes are conducted in a sealed mixer and different types of particles are mixed with the rotation of the mixer blades, to obtain a homogeneous particle mixture. In addition to the solid-liquid particle mixing problem, foaming asphalt problem, which is a liquid-gas two phase flow problem is also investigated. Foaming asphalt is generated by injecting a small amount of liquid additive (usually water) to asphalt at a high temperature. The volume change during this asphalt foaming process is studied. 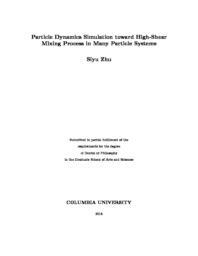 Given the problem statement, detailed methodologies of particle dynamics simulation are illustrated. For solid-liquid particle mixing, Smoothed Particle Hydrodynamics (SPH) and Discrete Element Method (DEM) are introduced and implemented to simulate the dynamics of solid and liquid particles, respectively. Solid-liquid particle interactions are computed according to Darcy`s Law. Then the proposed SPH coupling DEM model is verified by three classical case studies. For foaming asphalt problems, a SPH numerical model for foaming asphalt simulation is proposed, and simulations with different water contents, pressures and temperatures are conducted and the results agree with the experiments well. The coupled SPH-DEM method is applied to the particle mixing process, and several particle mixing numerical studies are conducted and these simulations are analyzed in multiple aspects. For the solid-liquid particle mixing problem, liquid plays an important role in the mixing performance. The effects of liquid content and liquid viscosity on mixing performance are studied. The mixing indexes of the mixture are applied to analyze the mixing quality, and the differences between three kinds of mixing indexes are discussed. Then mixers commonly used in industry such as Double Planetary Mixer (DPM) are modeled in mixing simulation and their results are compared with the experiments. Similar to other numerical simulation problems, the scale of the model and the accuracy of the simulation results are constrained by the computational capacity. Our in-house software package Particle Dynamics Parallel Simulator(PDPS) has been used as a platform to implement the algorithms above and conduct the simulations. Two parallel computing methods of Message Passing Interface (MPI) parallel computing and Graphics Processing Unit (GPU) acceleration have been used to accelerate the simulations. Speedup results for both MPI parallel computing and GPU methods are illustrated in the case studies. In summary, a comprehensive approach for particle simulation is proposed and applied to particle mixing process and asphalt foaming simulation. The simulation results are analyzed in various aspects to provide valuable insights to the problems studied in this work. Given the improvement of computational capacity, particle dynamics in higher resolution and simulations in more complex configurations can be obtained. This particle simulation platform is general and it can be straightforwardly extended to many-particle systems with more particle phases and solid-liquid-gas dynamics problems.